Roland Klingenberg, MD FESC studied medicine at the universities of Tubingen and Freiburg (thesis) with clinical training at Baylor College of Medicine, Houston, Texas and University of South Florida, Tampa. Subsequently he did his residency in internal medicine (board certificate) with a focus on cardiovascular medicine at the University Hospital Heidelberg (Prof. Dr. H. A. Katus). He continued with a postdoctorate period in experimental vascular inflammation at Karolinska Institute, Stockholm with Prof. Dr. G. K. Hansson. Acceptance into the Special Programme University Medicine - Inflammation and Acute Coronary Syndromes (SPUM-ACS) funded by the Swiss National Science Foundation enabled him to pursue a variety of projects with a focus on inflammation and biomarkers in ACS patients in close collaboration with colleagues at four university centers in Switzerland. He obtained his board-certification in cardiology (FMH) following a residency at University Hospital Zurich and was attending physician in Acute Cardiology from 2013 - 2015 (Prof. Dr. T. F. Lüscher) with habilitation in 2015. 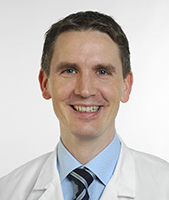 Early 2015 he moved to the Kerckhoff-Klinik in Bad Nauheim (Prof. Dr. C. W. Hamm) for a special training in Interventional Cardiology and has been working there as attending physician since 07/2018.